In the pork business, quantity without quality is like cake without icing: pointless. Traditionally, sow productivity has been defined as the number of piglets weaned per sow per year. However, the quality of those pigs weaned is also important to give them the best chance at reaching market weight in fewer days. Pig producer profitability is driven by the amount pork sold per sow in the herd, which makes weaning capacity a critical element for success. The Hypor Libra* is a prime example of optimizing weaning performance by focusing on key breeding criteria. These are perhaps the most important traits in Hypor’s reproduction package. Those heavier weights are vital to a fast start for piglets. At the nucleus units which house the purebred parents of the Hypor Libra* (Hypor Landrace and Hypor Large White), individual birth weights are taken on every piglet born, rather than weighing the entire litter and taking an average weight. This means Hypor’s geneticists can incorporate more information - like the range in birth weights within a litter - to select for lower variation or more uniform litters. The number of piglets weighing less than 800 gm (1.76 lb) at birth are also recorded to monitor (and reduce) the number of small piglets born. Improvement in both of these traits means heavy, uniform litters in the purebred populations, which is inherited by the Hypor Libra*. It is well known that weak, light weight piglets are likely to die before weaning. Therefore, a good start at birth plays a major role in allowing piglets to survive and thrive. 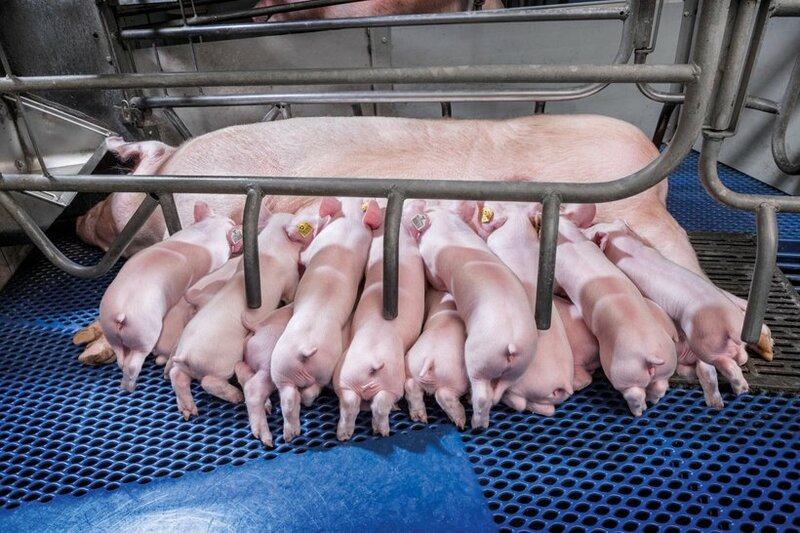 With this in mind, Hypor’s piglet quality package assigns extra points to heavier pigs at birth, penalizes litters with piglets born under 800 g (1.76 lb), and favors uniform litters. In order to have an optimal number of piglets at weaning and ensure they reach a heavy weight, the sow must be capable of raising them. From farrowing until day 14 in Hypor nucleus units, piglets are not given supplemental feed and solely consume milk from the sow. Consequently, piglet weight and growth during that period is directly related to milk production and quality of the sows. By measuring individual piglet weights at 14 days of age, it is possible to measure an individual sow’s capability to do just that – produce plentiful, high quality milk for her piglets – and this is why the Hypor Libra* boasts piglets that excel throughout their lives. Hypor adheres to strict rules on teat number and teat quality when it comes to selecting the Hypor Landrace and Hypor Large White replacement animals. At minimum, dam line boars must have 15 teats and dam line gilts must have 14 teats. 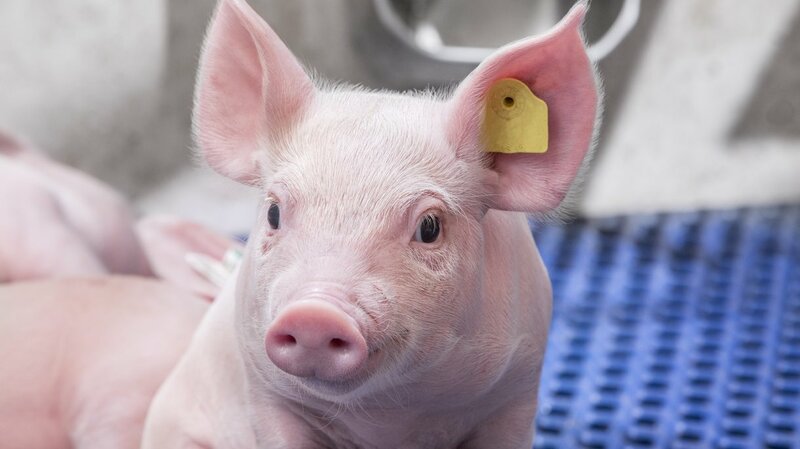 To improve weaning capacity further, sows at the nucleus level are constantly challenged to nurse as many piglets as their functional teats can accommodate. This ensures selection of the best sows, which will in turn produce the best replacement gilts to meet the future needs of pork producers. In addition, Hypor’s quality control staff examines a number of other characteristics that can spell success for its sows and piglets: teat length and shape, as well as even space between teats along the underline. “Unless they receive the quality control seal of approval, boars and gilts won’t be selected; it’s as simple as that,” says Vila. Quality is also a common theme at Hypor nucleus units, as they work to ensure they are selecting the best grandparents with excellent weaning capacity to pass on to the Hypor Libra*. To make that possible, the staff at Tullymet does everything they can to equip the sow for success. They ensure the sows are healthy, watered and properly fed, especially during the heavy demands of lactation, so she can consistently wean large, heavy litters, while not sacrificing body condition or future reproductive performance. Maximizing weaning performance involves a host of factors, but ultimately it comes down to a basic formula: Quality + Quantity = Profit. “When you have a sow that can do her job in the farrowing room, wean 16 – 18 piglets and return to service in under five days, you’re bound to prosper,” says Englot. In fact, profitability is at the heart of the Hypor Libra*’s appeal in many respects. Perhaps most importantly, the Hypor Libra* excels from start to finish, and so do her piglets, benefitting your business at every step. With Hypor’s focus on continuous improvement, the selling points of the Hypor Libra* are bound to increase. Yet given its current traits, any further enhancements will just be icing on the cake.